On square bases with canted corners, chased with foliate scrolls, animal heads and trophies on a matted ground, rising to tapering stems with panels of bellflowers, strapwork and trophies enclosing profile heads and octagonal sockets with similar decoration, one corner of the base well engraved with a coat-of-arms and helm within foliate scroll mantling. Struck under bases with warden's mark for 1713-1714 (Bibinet-Privat and Fontaines no. 324); with the charge and discharge of vaisselles montées of Paul Manis (op. cit. nos. 317, 320); maker's mark struck under bases and on sockets. Until the recent publication of La Datation de l'Orfèvrerie Parisienne sous l'Ancien Régime by Michèle Bimbenet-Privat and Gabriel de Fontaines, successive authorities on French hallmarks were unable to unravel the sequence of fermiers during this period. As these two scholars comment in their 1995 work, "De 1712 á 1717, aucune source documentaire n'est assez précise pour nous permettre de reconstituer d'une manière définitive la chronologie des poinçons des fermiers successifs: les objets conservés sont donc l'unique conducteur" (p. 102). Paul Manis is now thought to have succeeded Florent Sollier as fermier général des aides et drois joints sometime in late 1713 and to have held the post until October 1715, when he was replaced by Edme de Bonne for only five days. Manis then appears to have continued in his post until 1717. Jarrin's maker's mark appears in Beuque (no. 1775) but not in Nocq; the mark is recorded in the latter's analytical index but there appears to no entry for him, evidently an error. The design for these candlesticks, so typical of the baroque classicism of the latter part of the reign of Louis XIV, first appears in the early 1690s in the various versions of the published designs of Daniel Marot. 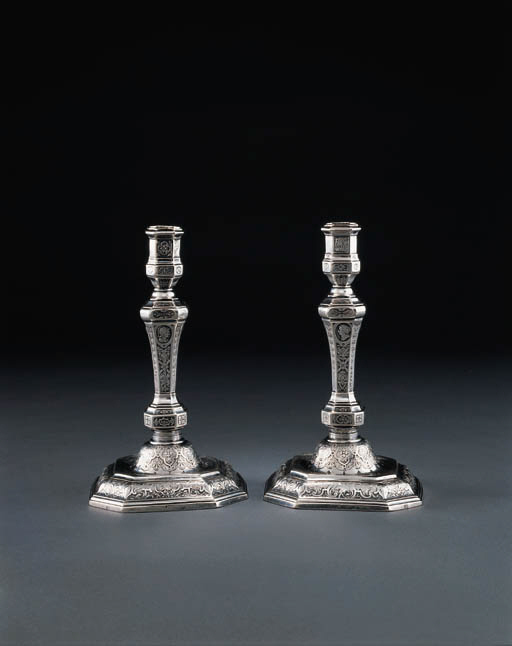 A pair similar to the present examples, of 1690-1 with the maker's mark of Charles-François Croze, is in the Metropolitan Museum of Art, New York, and a pair with two-light branches, of 1709, is in the Puiforcat Collection in the Louvre. Later silversmiths such as Nicolas Besnier continued to produce variations as late as the 1730s. The model was copied in England and elsewhere (see C. Hartop, The Huguenot Legacy: English Silver 1680-1760, 1996, pp. 105-107).